in Savaris, Norrbom, Marinoni & Lampert, 2019. 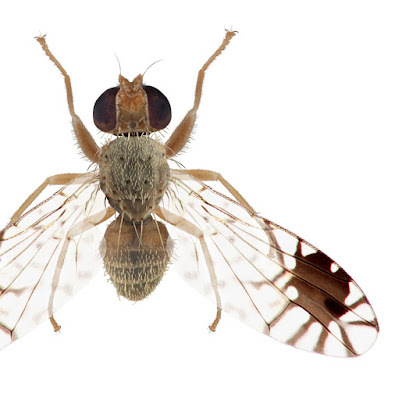 Species of the genus Euarestoides Benjamin (Diptera: Tephritidae) are revised. Euarestoides comprises six species: E. abstersus (Loew) (Bahamas, eastern Canada and USA); E. acutangulus (Thomson) (Canada, Chile, Colombia, Cuba, Dominican Republic, Ecuador, Mexico, Peru, Puerto Rico, Trinidad & Tobago, USA, and Venezuela); E. bimaculatus Savaris & Norrbom, n. sp. (Peru); E. dreisbachi Foote (Guatemala, Mexico, Peru); E. pereirai Savaris & Norrbom, n. sp. (Brazil); and E. rionegrensis Savaris & Norrbom, n. sp. (Colombia). A key to the known species of the genus is provided, as well as descriptions, illustrations, distributions, notes on the biology and host plant data for each species. FIGURE 1. 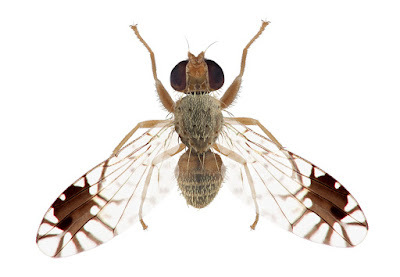 Habitus, dorsal: Euarestoides pereirai Savaris & Norrbom (♂, Brazil: São Paulo, Votorantim, USNMENT00118527). Scale bar = 0.5 mm.